In the Project Drawdown research quantifying the top 100 solutions for shifting to an economy that consumes greenhouse gases, reducing food waste ranks as #3 – just below #2 Wind Turbines and well above #10 Rooftop Solar – yes, really. This is a problem worth solving – and smart entrepreneurs are on the case. In Melbourne , two recent startups working in this space are Circular Food and Bring Me Home. They intervene at different places in the cycle – but both keep food out of landfill. Circular Food is the latest project of serial sustainability entrepreneur Steve Morriss – a new business model which collects urban waste food and turn it into high quality compost to grow more food. They collect food waste in the city and process it to reduce it’s volume and weight. Then it’s transported to a rural area where it can feed worms. Circular Food has combined three different technologies – Anaerobic Digestion and Dehydration in the city with Worm Farming on a rural property to deliver a scalable solution. Anaerobic Digestion also produces methane which is then used to generate electricity. Bring Me Home is a new app that lets you buy and pick up discounted surplus food from cafes and restaurants around Melbourne – food which would otherwise be binned. Bring Me Home’s mobile app connects you to cafes, bakeries and restaurants that have unsold food to sell at a discount. Using their app, you can buy quality surplus food which would otherwise be binned, and bring it home before the food retailer closes. Global warming, ocean plastics and a range of other challenges are caused by a whole economy built around extract/emit/exploit mindsets of the 20th century and before. 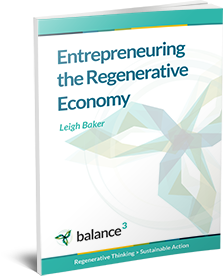 Despite 30 years of high-intensity messaging about “government policy” and “consumer behaviour”, the real solution for the 21st century is an economy designed to close loops, recirculate materials, regenerate ecosystems and renew communities. Project Drawdown estimates savings of $74 trillion in costs avoided in the 30 years required to deliver an economy that consumes greenhouse gases. Separate research on the UN Sustainable Development Goals estimates $12 trillion in private sector opportunity by 2030. If you’re serious about taking action, there could be smarter places to work than “lobbying government”. Find an entrepreneur you can turn onto the opportunities – or even consider becoming one. Thank you so much for featuring Bring Me Home!